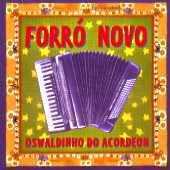 The traditional forró trio, comprising accordion, zabumba drum and triangle is synonymous with the popular culture of the Nordeste and with a characteristic, extremely sensual form of close dancing. Although he remains close to the musical culture of the Brazilian Northeast, Oswaldinho plays his own forró style, inspired by forró master Luiz Gonzaga as well as by Armstrong, Lennon, Bach and Beethoven. In this original Piranha recording, Oswaldinho presents thirteen songs for all, evoking the saturday nights atmosphere of the forró dance halls in São Paulo.